In 2015, 100% of seniors scored in the 89th percentile or higher on the ACS Diagnostic of Undergraduate Chemistry Knowledge. For Christians the study of chemistry is more than a way to improve life and make contributions to science. It’s a field in which to explore God’s awe-inspiring creation and learn more about Him. Through BJU’s chemistry program, you’ll study the importance of chemistry in our modern world and learn how the elemental building blocks of matter interact. While you’re a student, you’ll conduct laboratory work and produce professional-grade reports about your research. You’ll learn how to think like a scientist so you can tackle common industry problems, and you’ll discover practical ways to use your skills to benefit others and bring glory to God. 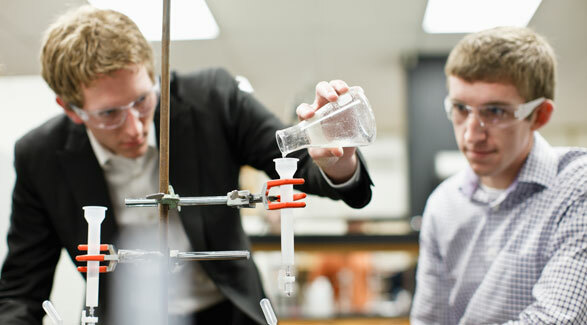 One of the defining traits of the BJU chemistry program is the emphasis on laboratory work. From your freshman year, you’ll use modern methods of chemical analysis to explore significant concepts and principles of chemistry. You’ll study a wide variety of topics, such as the quantum theory of the atom, chemical equilibrium and reaction mechanisms. Most chemistry classes have a laboratory component in addition to the lecture, so you’ll learn how to think like a scientist through weekly experiments and reports that you give. Your laboratory work culminates in a research project during your senior year, where you’ll be a member of a research team with your peers. During first semester your team will search scientific journals and formulate an original research project that you’ll implement in the lab during the second semester. Through the BJU Core you’ll learn more about the world around you so you’ll be able, like Jesus was in His time on earth, to make biblical truths understandable to people from a wide variety of backgrounds. And you’ll learn how your work ethic itself can be a witness—a reflection of God and His glory. Chemistry is a highly specialized program with all of your electives being part of the BJU Core. If you would like to take additional electives, you can explore taking classes over the summer through BJUOnline or increasing your class load during the semester. During my four years at Bob Jones University, I had numerous opportunities and experiences which served to develop my research skills and to strengthen my relationship with my Savior, Jesus Christ. The small class and lab sizes at BJU facilitated general learning, stimulated personal curiosity via the exchange of questions, emphasized attention to detail, fostered problem-solving, and allowed the enthusiasm and passion of my professors to shine through—qualities which have served me well in my 16-year career with Milliken Chemical. Another area in which BJU’s program showed great foresight was in the arena of communication. All of the lessons learned from those English papers and speech classes (aka Oral Communications for the Professions) have proved most handy later in life. Chemists spend a significant amount of time writing reports, experimental procedures, and preparing patent drafts, as well as delivering presentations to colleagues from research, sales and manufacturing on a diversity of subjects spanning safety, chemical synthesis, technical capabilities, customer needs and insights, and project management. Good oral and written communication skills are vital to an enduring career in the chemical industry. Last, but not least, was the tremendous mentoring and discipleship displayed by the faculty and staff of BJU. The time they invested in one-on-one conversations and sharing what they learned was so helpful and uplifting that I have never forgotten its impact on my personal and spiritual growth. I strive daily to emulate this quality in my life with my family, friends and co-workers and have found the privilege of participating in another’s growth to be immensely satisfying and rewarding. My experience at BJU enhanced my love and appreciation for science and for how fearfully and wonderfully we are made (Psalm 139:14) by our Creator and Savior. This electroanalytical instrument is used to study oxidation-reduction processes with experimental techniques known as cyclic voltammetry, chronoamperometry, and chronovoltammetry. You also have the option of joining the American Chemical Society and attend meetings of the Western Carolinas section. All five members of the chemistry faculty earned PhDs from research institutions and have published research in peer-review scientific journals. One faculty member conducted postdoctoral research, and one is a co-inventor on a U.S. patent issued to the U.S. Air Force. Another spent 20 years as a research chemist at the U.S. Naval Research Laboratory. And since joining the department of chemistry, three have participated in summer laboratory research at another university, an industrial company, or at a U.S. Air Force Base. All have participated in the BJU Summer Institute in Teaching Science over multiple years and have a combined total of more than 100 years of experience in teaching college chemistry. Account for the chemical and physical properties of substances in terms of chemical concepts and principles, and where appropriate to do so from the perspective of a biblical worldview. Solve problems by use of both mathematical and general scientific problem-solving skills in a variety of lecture and laboratory contexts. Execute standard chemistry laboratory techniques. Analyze data to identify trends and evaluate accuracy, precision, and statistical validity. Compose reports that communicate conclusions drawn from data analysis. Design and implement scientific experiments.